Dupaco Credit Union - Will you be able to retire debt-free? We know we have to save for retirement. But there’s another piece of the retirement-planning puzzle that’s sometimes overlooked: Managing debt. More people are heading into retirement carrying debt—and more of it—which can diminish the hard work that goes into building that nest egg. 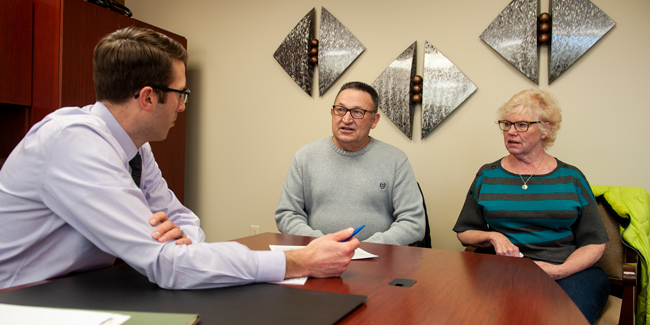 “It’s a tough conversation to have when you do the math and realize you’re mentally ready to retire, but financially you’re not,” says Suzan Martin-Hallahan, CFP®, a financial consultant at Dupaco Financial Services. MORE: Need to review your retirement plan? Dupaco can help. The Employee Benefit Research Institute studied data between 1992 and 2016, and found that American families just reaching retirement or those newly retired are more likely to have debt—and higher levels of it—than previous generations. In 1992, about 54 percent of families with heads ages 55 or older had debt. By 2016, 68 percent of families in that age group had debt. The average debt for this group in 2016 was about $77,000. In families with the oldest heads—ages 75 or older—the percentage having debt had increased by nearly 60 percent. Housing debt has driven many of these changes, according to the study. Today, more families change homes and jobs more often, Martin-Hallahan says. “We live a more expensive lifestyle today versus my grandparents’ generation that tended to stay in the same home until they physically couldn’t stay there any longer,” she says. The Great Recession, between 2007 and 2009, also has impacted many retirees, who lost their jobs and experienced losses in their investment balances during that time. Two other life changes that will upset any financial plan are unexpected health care expenses and divorce, Martin-Hallahan says. “This can create a situation where any previous retirement goals have to be completely reevaluated,” she says. MORE: Calculate how to reach your debt payoff goal with our calculators. Retiring with heavy debt loads can force you to take on part-time or even full-time employment in retirement. And it can lead to even more debt. MORE: Learn how to live debt-smart. It can also make it difficult to get approved for new loans. Ensure you’re on the right financial path to retirement by regularly getting a financial checkup—especially seven to 10 years out from retirement. Everyone’s financial situation is unique, so it’s important to meet with a financial planner to create a plan that fits your needs and goals. “It’s very, very important to sit down and create a strategy on how to address the current debt and current assets and how that compares to what the income stream will be in retirement, what makes up that income stream and the tax ramifications,” Martin-Hallahan says. Part of the financial checkup might involve changes to your budget today to help you reach your retirement goals in the future. Cutting unnecessary expenses can help you chip away at that mortgage, car loan and other debt. MORE: Need help reviewing your budget? Schedule a free Dupaco Money Makeover.